Programmable Trunnion Index Drives have the benefit of being completely flexible. The RT, TMF and TR series can all be equipped with any make of AC motor with absolute or incremental encoders for positioning. All of these models can also be equipped with any servo motor brand that will fit within your controls architecture or be compliant with your factory or end customers’ requirements. If robot auxiliary axis is what you need, all our programmable vertical rotary index tables can be adapted to fit the proper size robot motor to perfectly fit your needs. We have offered all our programmable trunnions with the following robot brands: Fanuc, KUKA, ABB, Motoman, Nachi, Panasonic. 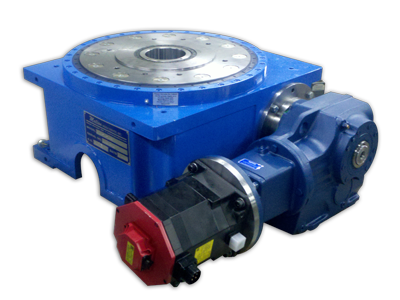 Our engineers will recommend the appropriate size of motor, based on mass moment of inertia, and torque requirements. 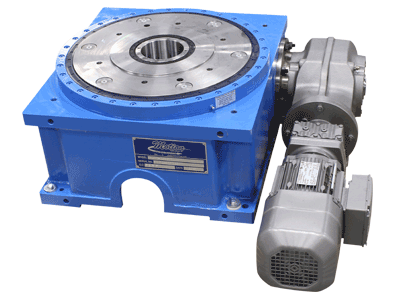 Fixed Trunnion Index Drives have the benefit of having a low cost to integration. Internally the fixed trunnion index drive has a mechanical barrel cam. The mechanical barrel cam is manufactured to give a mechanically fixed degree of output. 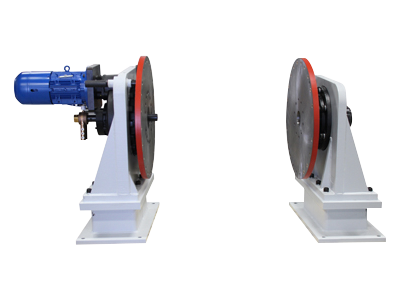 These units give a smooth acceleration and deceleration with a mechanical fixed dwell at a certain degree of rotation, essentially self-locking. Since these are barrel cam units, they inherently operate as a zero backlash indexing mechanism. The RT series can all be equipped with any make of AC, DC or Explosion proof motor. These models can also be equipped with any servo motor brand that will fit within your controls architecture or be compliant with your factory or end customers’ requirements. These units can be operated very efficiently with simple VFD units. 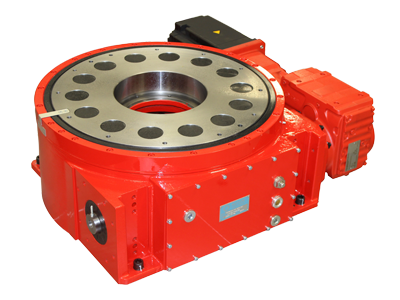 Since fixed trunnion index drives give a distinct mechanical degree of rotation and lock in place, commissioning time is kept to a minimum.